I did it. You guys, I bought a minivan. A beat-up old minivan, of course, because we’re just going to beat it up more and I don’t event want a minivan anyway, but there it is. And it’s unarguably a minivan. It has about a zillion cupholders and fits carseats galore and I am going to have to practice obsessively to be able to look cool casually spinning the wheel with one hand while I effortlessly parallel park the hulking monster. I don’t think of myself as the minivan type, obviously. But I hear that lots of people fall in love once they have one of these large, convenient, family-friendly vehicles. I’ll let you know how it goes. I do think of myself as the granola type. This one is no crisp, salty maple-y Olive Oil Granola, or buttery, delicate Walnut and Currant Granola. This one is health food. It’s almost aggressively crunchy, barely sweetened with juice and honey, and has no oil whatsoever. It bakes into addictive crunchy clumps that you will probably find yourself eating by the handful each time you pass the jar. That’s ok, it’s super healthy. I’m going to eat this granola in my Birkenstocks while I pretend that my minivan is a 1960’s VW bus. Honey-Almond Granola with Orange Zest: In a large bowl, mix 5 c. rolled oats, 1 c. roughly chopped or slivered almonds, 1/2 tsp. salt, and the zest of two organic oranges. Pour the following wet ingredients into the bowl: 1 c. orange juice, 1/2 c. honey, 1 1/2 tsp. vanilla. Mix well and spread onto a large rimmed baking sheet. Bake at 300, stirring every 10 minutes, until deep golden but not-quite-brown, about 40-50 minutes. Optional: stir in 1 c. currants or raisins as granola cools. If you double the batch (and why not? ), you will want to bake the granola on two rimmed sheet pans and switch them top-to-bottom every ten minutes as you stir. This entry was posted in Baking, Breakfast, Food, Recipes and tagged granola minivan, kids, whole grain on June 8, 2012 by emmycooks. I like the addition of orange! Definitely trying this one out! I love anything with orange zest. I recently got a new zester that grates it a little more coarsely than my old microplane and I love it. It’s just a little more bitter and a lot more flavorful! That sounds absolutely fabulous! I’ve been into the oatmeal lately – granola, granola bars, cooked oatmeal, oatmeal sandwich bread…gotta love oats! Yes to oats! We buy them in 25 lb. bags because we go through them so fast. I am in search of a good granola bar–do you have a recipe you like? Perfect timing! I just came up with a chewy granola bar recipe that I am posting tomorrow, if all goes as planned. Where do you buy 25 lb. bags of oats? I had to send this post to my best friend.She has a mini van which she refers to as her ‘chariot’ and feels exactly as you do about the cool factor. But she has embraced the mom-mini van relationship and I think she does look cool. And I am sure you do too…. And even if not, I am sure your kids think you are the coolest. As soon as I read this post, I had to send it to my best friend. She has a mini van which she refers to as her ‘chariot’ and feels exactly as you do about the cool factor. She has however embraced the mini van for now and I think she does look cool. And I am sure you do too. And even if that doesn’t reassure you, I am sure your kids still think you are the coolest. They loved it, they just wouldn’t admit it. Minivan! It’s all good–I learned to drive in one, and looked especially cool borrowing it and cruising around with my friends at age16. :) I love the idea of adding orange zest to granola! Awww! I remember when my brothers were in middle school and I was in high school. Suddenly my parents had to haul three kids, band instruments, backpacks, science projects, AND groceries AND other people’s kids (carpool) AND themselves. They caved and got a used minivan too. They held out for a looooong time! If you get an soccer decal, get some mom jeans! Take a picture! It will be so funny! You know what would go well with these granola? Crocs in pink camo and mom jeans. Oh, you crack me up. I had never seen that before. AWESOME. ummm, did you see the free applique vest with every purchase??? I’ve been making olive oil maple granola addictively, but the prospect of no oil is very inviting. Will try this weekend. I drive a giant SUV, we only pretend it’s ok b/c it’s a hybrid, but it is like steering a cruise ship. 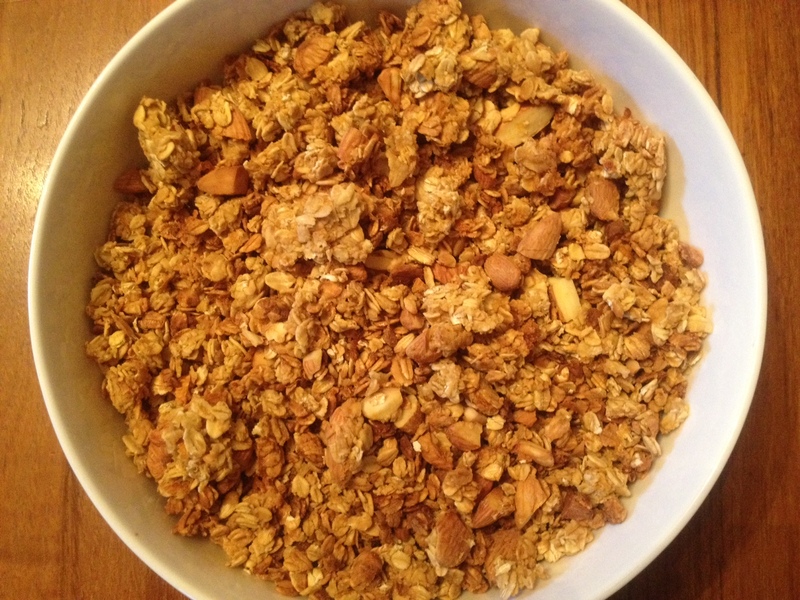 Do you ever toss in flax seeds or wheat germ to make your granola even healthier? Recommendations? Oh, Sonya, it makes me feel better to know that you drive a cruise ship too! :) Yes, I often use wheat germ and/or (ground) flax seeds. I like to use them in recipes where the granola clumps well so it doesn’t all just fall to the bottom of the jar, and I wasn’t sure about this recipe because I was making it for the first time. Turns out it holds together beautifully, so I might try this next time with apple juice, raisins, and wheat germ. (Before that, though, I think J will probably want another batch of the dessert-y olive oil one for Fathers Day.) This is another variation I always add wheat germ to: https://emmycooks.com/2012/01/07/cherry-almond-granola-for-breakfast/ (of course you can use any fruit and nuts). xoxo to you all!